From a studio nestled in the Highland Lakes Chain, artist Ralph Moresco translates his view of movement into kinetic sculptures. 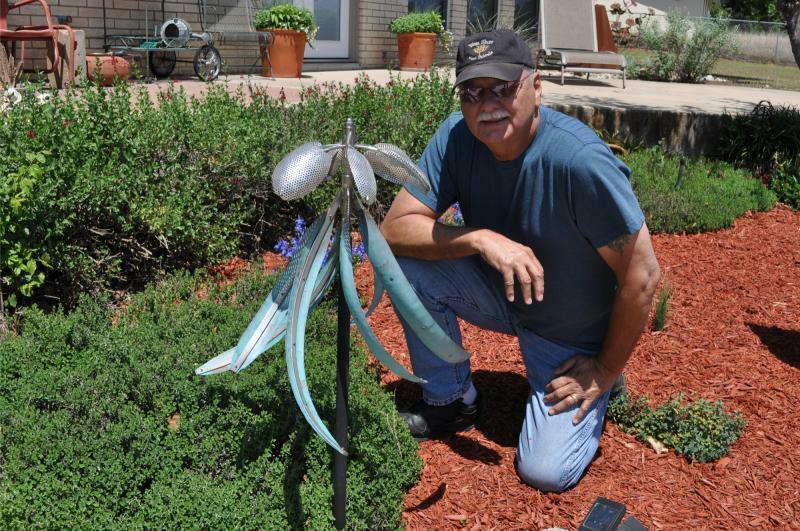 This self-taught artist's enchantment with kinetics began over 10 years ago, when he retired after 30 years in the petrochemical industry to Lake Buchanan in the Texas Hill Country. With spare time on his hands, Ralph decided to take a welding class and from that point on he was hooked on working with metal. Having a love for both mechanics (from his drag racing days) and kinetics (movement), he drew these together to begin creating his wind spirals. Ralph designs and builds "Wind Spirals", a form of wind driven kinetic sculptures in his Lake Buchanan Studio. These pieces of art are wrought from sheets of copper, stainless steel, and brass. Using a combination of tools, he first hand cuts the blades, then shapes them with a shot bag (a centuries old method), and completes the shaping process using an English wheel. For other components of the spirals Ralph uses milling machines, lathes, drill presses, welders, and an oxy-acetylene torch to create the pieces used in the final creation of each spiral. Once created, each spiral is hand finished using a technique developed through many years of experimentation. The patinas he uses are of the highest quality and sealed with a high temperature matte coating to provide long-term protection. All spirals can be custom finished for individual preferences. Elements of nature are harsh on outdoor artwork. Over time finishes will undergo change resulting in an aged appearance of the spiral. The award winning spirals that Ralph creates are made to withstand winds up to 70 m.p.h. and extreme temperatures (both factors in the hill county). When installing the artwork keep in mind trees can be hazardous to the view and falling limbs can damage the spirals. Each piece comes with a two-year warranty on all parts due to defects of workmanship and/or materials. Ralph's work has been featured in several publications, local news articles, and national magazines.